zebra, wildebeest, waterbuck and eland — a full range of typical plains game ranging from under 100 pounds to a ton in weight. Among the clean 1-shot kills witnessed were a gemsbok taken with a 150-grain Nosler Partition from a .270 Winchester and a blue wildebeest shot with a 140-grain Nosler AccuBond from a 7mm-08 Remington. Both were big bulls, and neither went over 50 yards before falling, because they'd been shot right through the center of the pulmonary system, around the top of the heart. Nothing lives long when shot there, even with relatively small bullets. I personally used a bigger bullet on a huge-bodied black wildebeest with one broken horn, a 156-grain Norma Oryx from my 7x57 Mauser at a muzzle velocity of about 2,650 fps. The bull stood facing at around 250 yards. Facing shots aren't normally recommended on wildebeest, but the crosshairs were very steady. We could hear the "clop" of the bullet striking Just as he turned to run — about 60 yards before going down. He weighed right at 400 pounds on the ranch scale. Those are just three examples out of dozens of 1-shot kills on big, tough plains game animals with "deer" cartridges. The guy with the 7mm-08 also killed a gemsbok at 260 yards with one shot. Eileen and I went to South Africa in 2008. This time she used a .308 Winchester with 150-grain Nosler E-Tips handloaded to about 2,800 fps, and I took my 7x57 with several different bullets: 156-grain Norma Oryxes, 160 Sierra GameKings, 160 Barnes Triple Shock X-Bullets. 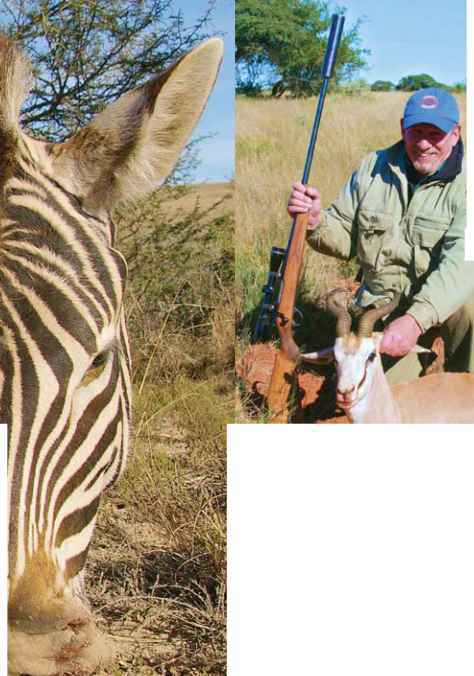 We both killed a wide variety of game, ranging up to zebra (Eileen) and kudu (me), with no problems. We never shot at anything beyond 250 yards, but that's fairly typical of Africa, even in open country. 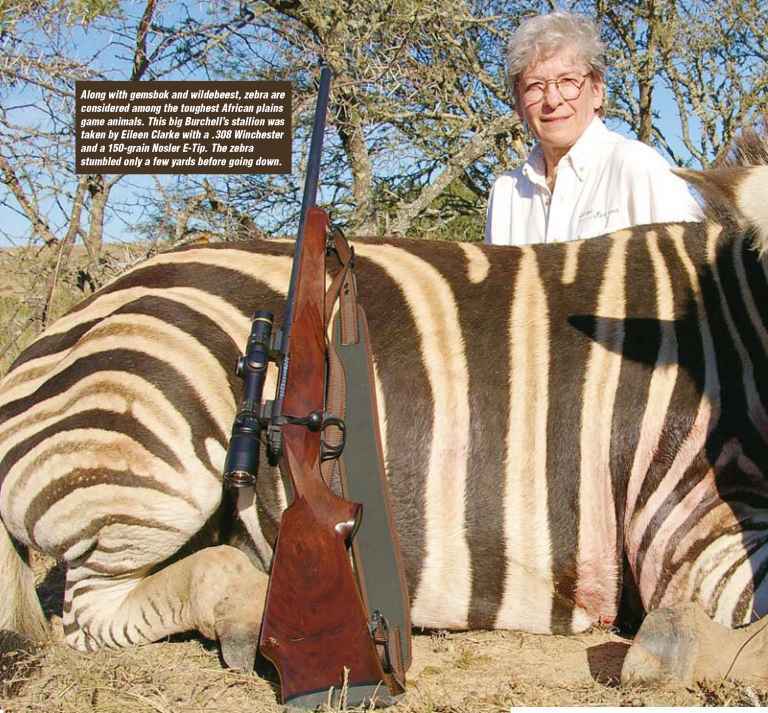 Much culling of smaller African animals is done with the .22-250 Remington. Larry Tahler shot this springbok at 350 yards with an old Sako .22-250 with a suppressor, legal in Africa. A typical lung shot brought the ram down quickly (above). 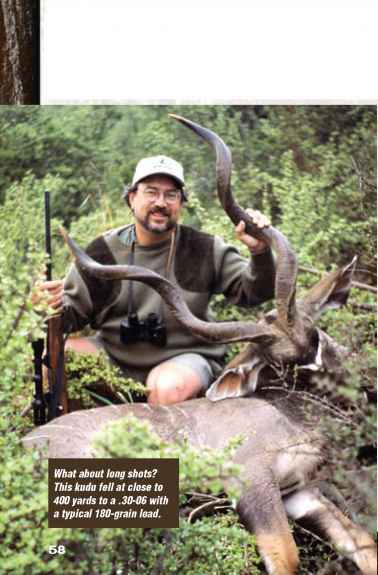 This gemsbok bull (below) fell within 50 yards to one well-placed 150-grain Nosler Partition from a .270 Winchester. me at with a .22-250 belonging to our PH, Rob Klemp. Rob has taken over 10,000 springbok with that rifle. Does he use bullets designed for big game? No. On that day we shot one of his favorite springbok rounds, the Winchester factory load with 55-grain softpoints, and we had no problems. My long-range kudu fell to a single 180-grain Nosler Partition from a .30-06. The bull was standing high up a very steep mountain, quartering slightly toward me. The bullet entered just inside the near shoulder, then cut a major artery and broke the spine and far shoulder before stopping under the hide. The kudu, of course, went right down. for separately, with a "trophy fee." This might range from $250 for a springbok to $2,000 for a nyala. The trophy fee is assessed whenever an animal's shot, whether recovered or not. 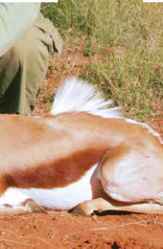 Almost all are recovered, due to the skills of the trackers, but just thinking about paying $1,200 for a kudu that disappears keeps most hunters from taking very long shots. Some African game is very tough, but so is some American game. I would rate pronghorn as much tougher than springbok, their African equivalent in coloration, size and environment. The various hartebeest are certainly no tougher than a big northern whitetail. Gemsbok and wildebeest don't give up easily, but neither do elk. Eland actually have the reputation of being somewhat wimpy for their size, as moose do here. So why does African game have the reputation of being incredibly hard to put down? First, many first-time safari hunters don't shoot very well, especially offhand, even when resting their rifle over shooting sticks. Americans who can afford safaris are often busy businessmen, who don't get to the range very often — and almost never shoot offhand. Second, 90 percent of American hunting is for whitetails, usually from a stand. Deer hunters are used to aiming behind the shoulder, to shoot-up as little meat as possible. This works pretty well with the fairly soft bullets most deer hunters use, because the bullet will still shred the lungs. But shooting a gemsbok very far behind the shoulder with a tougher bullet puts a little hole in the fringe of the lungs, and a gemsbok (or an elk) can go a long ways with such a wound. Instead, African pH's urge shooters to aim for the shoulder. The shot may not hit bone, but at least it will center the lungs, often around the top of the heart. Even gemsbok and wildebeest don't go far when hit there. There isn't much concern about blood-shot meat in Africa, especially when an American is paying to cull, and most black Africans don't care if meat's bloodshot, as long as it's meat. Third, most Americans don't get to shoot enough on their first safari to get used to shooting off sticks or aiming for the shoulder. They take the four to six animals on their list and fly home, convinced of the supernatural toughness of African game. They'll usually shoot better on their second safari, if they ever make one, but they'll still be convinced African game is very hard to put down. 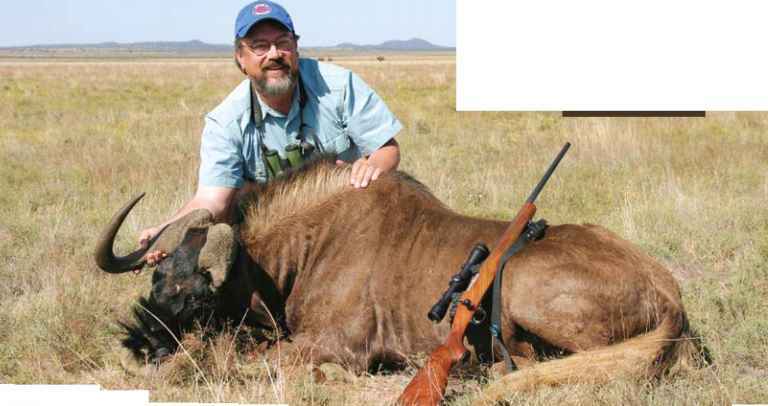 John killed this broken-horned black wildebeest with one 156-grain Norma Oryx at 250 yards with a 7x57. "Americans tend to fret over which premium bullet to use. 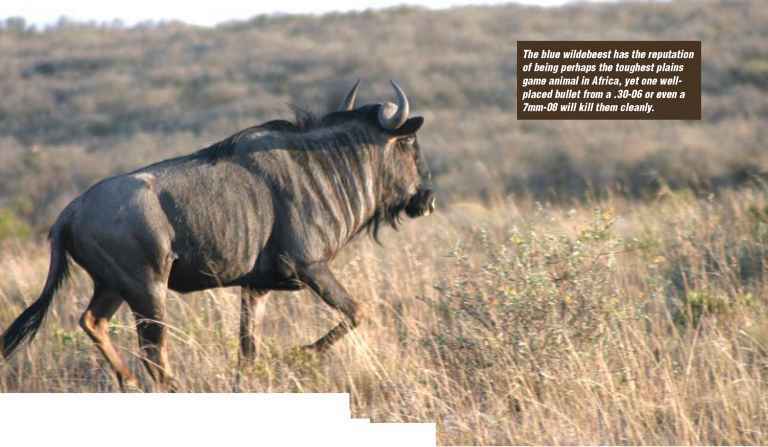 The bullets used on the cull shoot were dominated by two relatively recent introductions, the Barnes Triple Shock X-Bullet and the Nosler AccuBond, along with a few Nosler Partitions, Norma Oryxes and Trophy Bondeds." Africa, and even today they're very expensive. In Rob Klemp's sporting goods store in Kimberley, Nosler Partitions sold for over $100 a box of 50. Consequently many African hunters shoot cheaper, heavier conventional bullets at moderate velocity. This is why many PH's suggest a .338 with 250-grain bullets or a .375 with 300s, cartridges that usually make whitetail hunters flinch. But with today's array of "premium" bullets there's no reason to use 250- or 300-grain bullets on 400 to 700 pound animals like gemsbok, wildebeest, zebras and kudu. Americans tend to fret over which premium bullet to use. The bullets used on the cull shoot were dominated by two relatively recent introductions, the Barnes Triple Shock X-Bullet and the Nosler AccuBond, along with a few Nosler Partitions, Norma Oryxes and Trophy Bondeds. The TSX is designed to retain all its weight and the AccuBond to lose about a third. Many hunters are convinced only one of those answers is correct. In reality both work just fine when put in the right place, as did any of the other bullets. Now, if you can shoot a bigger rifle, by all means bring it. The best shooting on the cull was by a guy shooting a .338 Winchester Magnum and 225-grain Nosler AccuBonds. He made a dozen one-shot kills in a row, mostly on bigger animals, before missing one blue wildebeest he tried to head-shoot to preserve the skin for a rug, and shooting another animal. That is great shooting. Also, Africa is Africa. On my first safari in 1993 my rifle was a .375 H&H, even though the biggest animal on the itinerary was kudu, because this was my African rifle. The .375 works very well on all sizes of plains game, and is particularly good on eland — but only if you can shoot one well. I can, and when the moment of truth came on the kudu, I put a 300-grain Nosler Partition through both lungs of a big bull at about 225 yards. Back in 2008 I wrote a column in these pages about finding a Winchester made World War II vintage M1 Carbine. It was still in its original 1943 configuration, which is somewhat amazing as the US Government called back most of them after 1945 and upgraded them with different sights, bayonet lugs, stocks and so forth. Neither that column nor that Ml Carbine satisfied the lust in my soul, perhaps because the Ml Carbine was the first firearms lust I experienced back in my teen years. I've become a .30 Carbine reloader (again) a reader of several books on .30 Ml Carbines, and a proud owner of a select fire M2 .30 Carbine. And I'm hunting for an M1A1. M1 Carbines began to appear on the civilian market. They were even featured in the pages of Sears' catalogs and I remember coveting one endlessly. Sears' exact price escapes me now but I do remember the cost being far above the bucks a 13- or 14-year old could raise. Then in 1964 I somehow learned the Director of Civilian Marksmanship was selling M1 Carbines to National Rifle Association members for only $20. I badgered my non-shooting father into joining the NRA and applying for one. It, made by the Underwood-Fisher-Elliot typewriter manufacturer, arrived in early May of 1965 right about the time of my 16th birthday. I couldn't have received a finer present. Duke loves pirnkmg at steel targets with the M1 Carbine and cast bullets at about 1,700 fps.